While on assignment last year in Thailand, one of the places I was sent to photograph was the Elephant Hills Resort located in the Khao Sok National Park. This resort has two locations: 1) a luxury tented camp located adjacent to the Khao Sok National Park and 2) a line of floating luxury tents that are situated on water in the Cheow Larn reservoir called The Rainforest Camp. This body of water was created when the Ratchaprapha dam was built in 1982 on the Khlong Saeng River. Khao Sok National Park boasts the largest area of virgin forest in Southern Thailand. Elephant Hills on land offers kayaking, jungle trekking and helping to care for the captive Asian elephants. These elephants were used for logging and after those operations stopped, the elephants became part of a sustainable tourism program in Thailand. 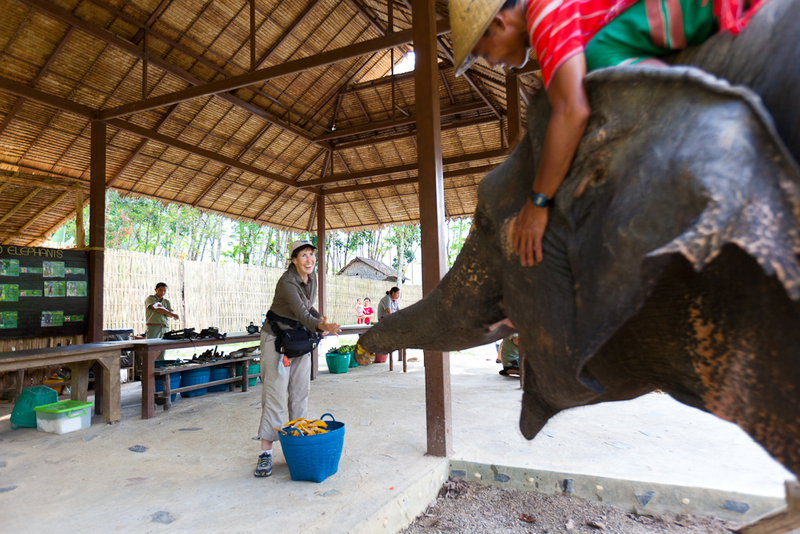 At Elephant Hills you don’t ride the animals, but feed and bathe them while the mahout gives you guidance and education about these amazing animals. I had the pleasure of covering both properties. The shoots were fast and furious, a day at each location, with the usual challenges. However, it was beautiful to kayak on the Sok River, feed the elephants and listen to the sounds of the jungle from my tent at night. At the Rainforest Camp, I was fortunate enough to not only experience some fine kayaking and long tail boat rides, the guide took me on a jungle trek. Within ten minutes on the trail, we were lucky enough to encounter three different types of primates: Macaques, Gibbons and Langurs. They were very agitated and making lots of noise. Here is an audio recording of what we heard: khao_sok_monkeys. I encourage you to have a listen. Initially, the guides thought that the monkey ruckus was because of a territory dispute given that they were all in a jack-fruit tree. We soon discovered that the monkeys were upset because there was a clouded leopard sitting in the tree directly above us, likely deciding which type of monkey it might like to have for lunch. I looked up just in time to see it leap across the branches above my head, crawl down the back of the tree, head first, and silently creep off into the jungle. (read: missed the shot!) Everyone in our group was shocked as these wild cats are not expected to occur in this area. As we continued hiking through dense ficus we ended up at a limestone cave which was filled, much to my dismay, with bat eating snakes. I wasn’t told that we’d be heading to a cave, much less one filled with hungry snakes, so I hadn’t brought a torch. When the guide noticed me climbing up one of the slippery rock formations to try to get a better shot of the cavernous space, he yelled up to me, “mind where you put your hands. There are loads of snakes!” and directed his torch to one curled up on the top of a very tall stalagmite. I froze in utter fear, then slid down the steep, muddy outcropping to safety. We poked around the cave and found a few snakes in the wall crevices. One had a very full belly, an indication of a successful hunt. We finished off the day with a long tail boat ride back to camp where we immediately hit the mammal identification books to confirm our leopard sighting. It was a marvelous experience and an assignment I’ll never forget. Another day at the office! Taking a long-tail boat back to the camp for breakfast after a dawn shoot. 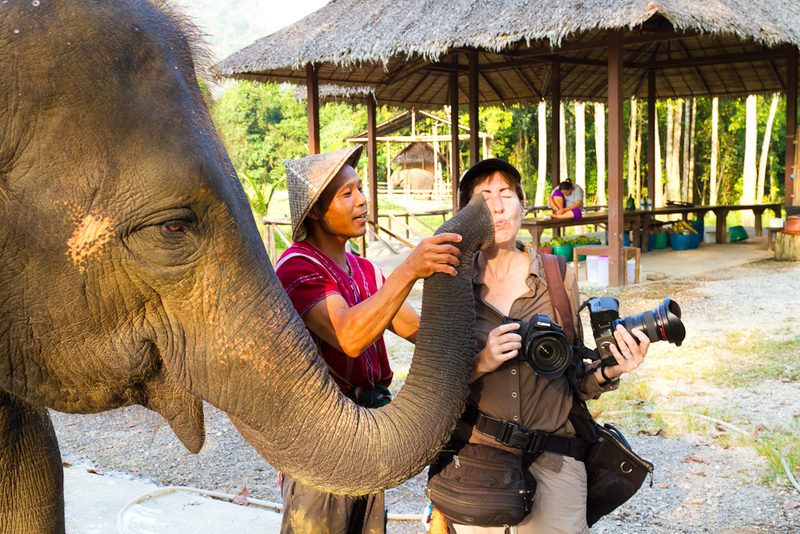 The mahout helps the elephant give me a kiss! You can see more images from Elephant Hills in Thailand on my stock photography site here.